Living in an expensive city has taught even the trendiest girl to be thrifty. With deal websites like Groupon, Lifebooker, Living Social, Gilt City, and Scoutmob arriving daily in your inbox, taking advantage of these deals on everything from spa services to dining is a no-brainer. While printing out a $25 Restaurant.com gift certificate that you only paid $2 for to redeem with your girlfriends for a week night dinner is a great way to save a few bucks, deal sites for first dates is an etiquette no-no. Sure, you'd like a guy who's wise with his money. 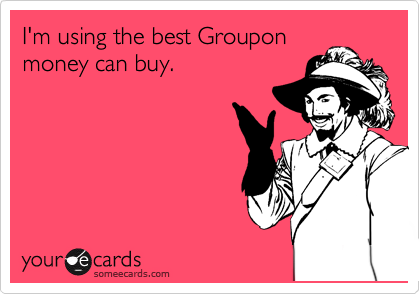 But, using a Groupon on a first date might make him look cheap, not savvy. One of my best gals went on a first date with a guy she met through a friend. With so much in common (from political views to an obsession with Seinfeld) they seemed like a match. Unfortunately, in person he wasn’t Prince Charming. He lacked manners and social skills. To make matters worse, when the check arrived at the table, he not only rudely told her he expected them to split the bill (he did not ask or suggest it), he also whipped out a coupon from a popular deals site. Splitting the bill is one thing, but adding on this discount makes for an embarrassing scenario. Ladies want to be treated on a first date. We may be independent, making our own salaries and paying our rent, but we'd like to be wined and dined at the beginning of a relationship. Once you're a couple I encourage using these discounts to enjoy the city you love together without emptying your savings. And I also believe that a lady should cover the bill from time to time. Yeah, first dates are a big NO NO. Once you get a feel for the person it might be okay to use a groupon or something... and only if they go about like like "Hey, i got this groupon for a great sushi dinner spot- do you want to try it out with me?" and thats once i get a feel for the kind of person he is. What kind of idiots is this girl dating? So typical ;) great post Sarah!